I'm going to watch every single Disney animated film. Let me rephrase that. I'm going to watch every theatrically released animated film. Not the direct-to-video sequels and such. 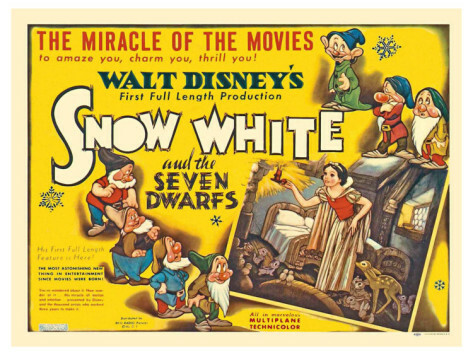 Between 1937 and 2012, from Snow White and the Seven Dwarfs to Wreck-It Ralph, Disney has released 52 feature films (you can find the list here). I know that I've seen at least thirty of these at some point during my life. But looking through the list, there are so many of the more obscure ones that I've never seen before. I'm a huge Disney dork, but there are dozens of Disney films that I haven't seen yet! Incredibly, because Disney is so obsessive and good at having everything covered, all of these are still available. The ones that I don't have on DVD (I'm collecting my favorites as they're released from the infamous vault) or VHS, I'll be getting through Netflix. I'm really excited about this, you guys. I know it'll probably take a year or two, but that's okay. I don't want to overload you all with one Disney post after another. But I can't wait to feel all nostalgic as I watch movies I loved as a kid, and I can't wait to discover some new Disney treasures that I've been missing out on all this time! Have you watched all of the Disney animated feature films? Which are your favorites and least favorites? Do you want to unofficially join in, too? This is a totally cool idea and I think I'm gonna do the same thing! I'm a Disney fanatic as well, but have only have seen 15 of the animated movies. That's kinda sad, but I'm more into Mickey Mouse and the parks, so that's not super surprising. I've been wanting to do the same thing with Pixar films, but I really like this idea too! Awesome idea and I look forward to reading your posts! Looks like I've seen about 30 of the theatrical films...and I'm so glad you posted that Wikipedia link, because I clicked on "Frozen" and it sounds FAB. On that list I hadn't even heard of numbers 6-10! I've seen around 30 of those films (remembering the details of some, better than others...) and realized that other than Tangled and Bolt, I haven't watched anything newer than Treasure Planet. Part of that has to do with Pixar's awesomeness, but still, I should try to fill in the gaps. :D I'll have to see how many I can get through our measly, small town, inter-library loan, but it will at least be fun to hear your thoughts. Great idea! You should check out the Studio Ghibli movies too. Disney was in charge of a lot of the American re-releases and did a good job of picking voice actors. Ah yes...the infamous vault. Did you hear that they're releasing The Little Mermaid?? Yes, please!!! And I still have to get my copy of Cinderella. A little trip (and a big yarn haul).